TexSport Publications: Army totally dismantles Houston with 70-14 win in Armed Forces Bowl. Army totally dismantles Houston with 70-14 win in Armed Forces Bowl. FT. WORTH, TEXAS (December 22, 2018) In a game that saw the Cougars suffer their worst defeat in a bowl game in their long-storied history, Houston dropped a 70-14 decision to the No. 22 Army Black Knights in the Lockheed Martin Armed Forces Bowl at Amon G. Carter Stadium in Ft. Worth, Texas. The loss was the third-in-a-row in post-season play for the Cougars, who dropped to 8-5 for the season. The Black Knight took control of the game in the first quarter, when quarterback Kelvin Hopkins, Jr. scored twice, with rushes of one and 77 yards, in the final 3:58 of the quarter. The 5-10, 205-pound junior, carried the ball 11 times for 170 yards and five touchdowns in route to Army's third win in the Armed Forces Bowl. Their previous wins came in 2010, where they downed SMU 16-14, and last year; beating San Diego State, 42-35. 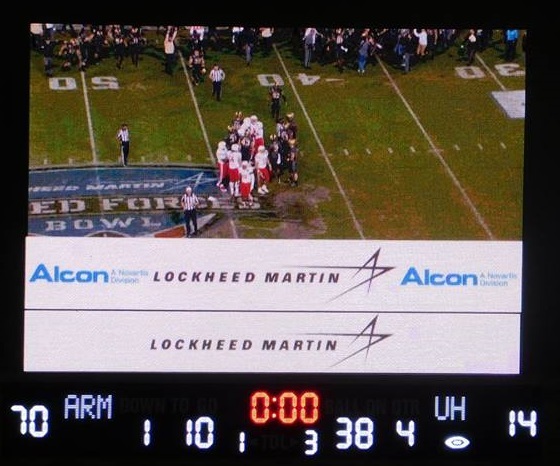 The Black Knights became the first team to win three-total Armed Forces Bowls. Hopkins, was three-of-three for 70 yards in the air, and was honored, as a result of his performance, as the game's Most Valuable Player. In fact, Hopkins had more rushing yardage (170) than the entire Houston offense (87 yards on 41 carries). The Cougars managed only 14 first downs, while Army tallied 70. Hopkins 170 yards on the ground was just a small part of the Black Knight's total (570 yards). To add insult to injury, immediately after the game, it was reported that Houston offensive coordinator and quarterback Coach Kendal Briles was leaving the program to take a similar position at Florida State. It was also reported by numerous outlets, that run-game coordinator/offensive line coach Randy Clements and two graduate assistants would be leaving Houston to join Briles at FSU. The Cougars will now begin to prepare for the 2019 season. They will have 252 days to prepare for their first game of 2019, against the Oklahoma Sooners in Norman, Oklahoma.